This has been the definitive book on the subject for almost as long as I’ve been playing. Includes an essential, very concise but thorough explanation of terms and notation in professional charts. There are one or two page introductions to swing, rock, “Latin” and country styles. The swing section is good, the single page of Latin grooves is pretty dated; people have gotten much more serious about authenticity with those feels since the mid-80’s. Probably most important for drummers are the pages on articulating a horn part, the “eighth note rule”, and jazz phrasing. There are also many pages of sample ensemble figures, and authentic playalong charts. College level. 68 pages, with 2 CDs of recorded figures, ensemble passages, and studio charts. 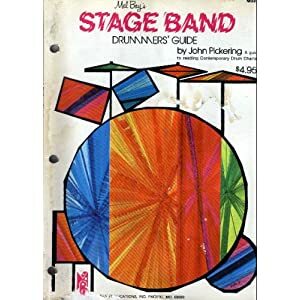 “A guide to reading and understanding stage band charts.” An excellent older book from Mel Bay, though I don’t know how easy it will be to find a copy. I got mine used on eBay. Completely focused on chart interpretation, which it covers very thoroughly; aimed at somewhat more inexperienced readers, but explanations are presented with subtlety, and are not dumbed-down. Short on actual drumming vocabulary/technique- for that, get Houghton or Rothman. Includes many pages of sample figures. High school to college level. 96 pages. A unique book which I assumed was out of print until I found it at Steve Weiss Music– maybe it is out of print, and they’ve just got old copies on hand. 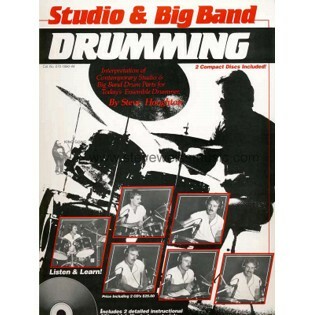 It has just eight pages of Lewis’ opinionated guidelines on every aspect of the instrument itself- drums, cymbals, heads, sticks, brushes- and two pages of musically-oriented technique, with the whole remainder of the book dedicated to chart analysis. Using a grand staff with the lead trumpet part on top and the drum chart on the bottom, the authors look at several well-known Thad Jones/Mel Lewis band charts, including Cherry Juice, Thank You, and Central Park North, with notes on interpretation. More narrowly focused than the other books- and more specific about exactly what you are supposed to play- this thoroughly explores creative ways of setting up kicks. There is characteristically little in the way of written text- Rothman is an author who always seems to respect the role of the teacher, and does not over-explain his materials. And as always, he keeps a practical, playable approach. 66 pages. High school to college level. Another great out of print book, which I just saw in my friend Steve Pancerev’s library. It’s a classic I used briefly when I was in high school, and was able to leaf through Steve’s copy, but didn’t take in enough to say anything intelligent about it. Get a copy if you can find it.